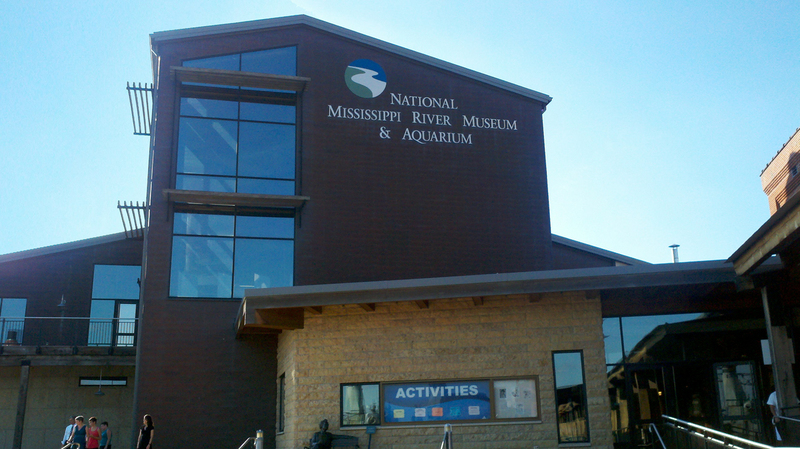 environment | MTI: Masonry Technology Inc.
What do you get when you combine environmental awareness, educational opportunities and historical understanding – The National Mississippi River Museum & Aquarium! Located on the banks of the Mississippi River in Dubuque, Iowa, the facility is a mecca for those interested in all things aquatic. My wife and I had a chance to explore it when we spent a day in Dubuque during a recent fall motorcycle trip. 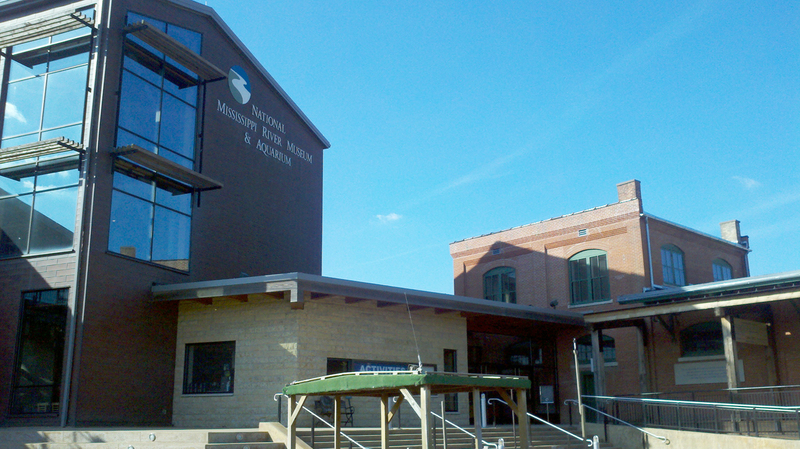 The center consists of two main buildings as well as an assortment of boats and other outdoor learning stations and is located in the old Ice Harbor area on the west bank of the Mississipi River near downtown Dubuque. 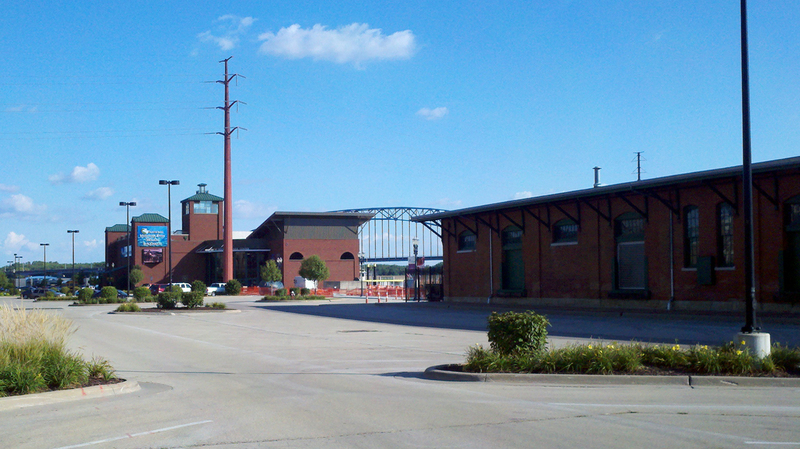 The first part, the William Woodward Mississippi River Center, opened in 2003. Designed by EHDD Architecture of San Francisco, the structure houses multiple aquariums and exhibits. According to EHDD’s website, the client wanted a structure that fit with the 19th Century riverfront and industrial architecture of the city. Local materials like limestone and wood frame windows were chosen so the structure would blend seamlessly with the surrounding buildings. 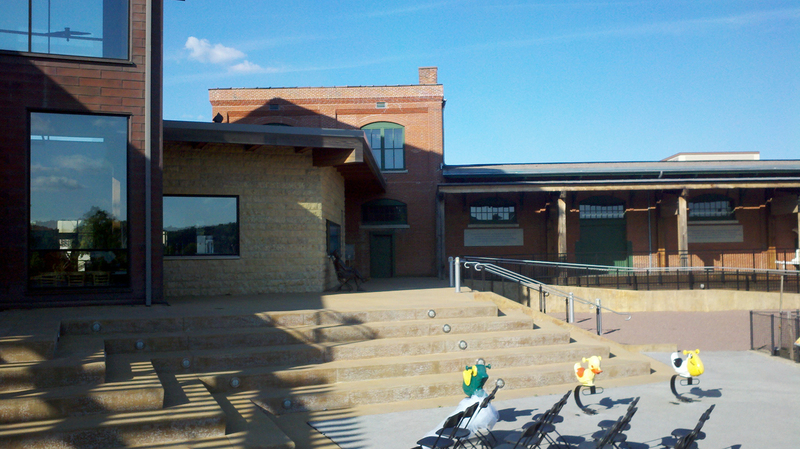 The new portion of the facility (seen on the left side of the photos 1-3 below) was combined with the old Dubuque Boat and Boiler Works factory (the low-slung structure at the right in photos 1-3). 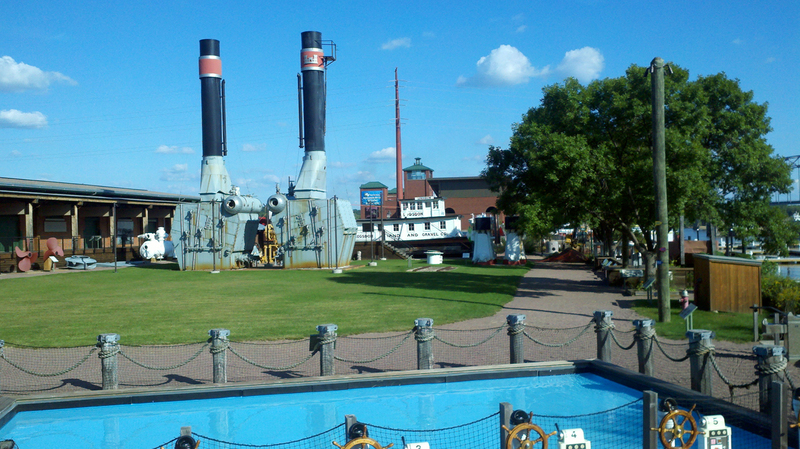 At the time of its closing in the 1970s, the Dubuque Boat and Boiler Works company was the second-oldest ship builder in the country. During its operational life, the company built everything from steam-driven riverboats to naval sub chasers and mine layers. Inside the main facility are eight aquariums with fish, amphibians and reptiles from all ecosystems along the 2,552 mile-long Mississippi. There are also many historical displays to explore. You can step inside a riverboat, explore life on a flatboat, and view the natural habitat of the Mississippi on a boardwalk trail; these are just three of the many educational opportunities available to visitors. There is also a hands-on learning center with a touch-tank and many animal specimens. You can even partake in outdoor environmental presentations like a river otter show and step aboard a real Mississippi riverboat, the William M. Black, as well as a tug, the Logsdon. In 2010 the Diamond Jo National Rivers Center was added to the campus. While the original facility, the William Woodward Mississippi River Center, is primarily focused on the Mississippi, the National Rivers Center designed by Christopher Chadbourne and Associates, deals with a wide variety of aquatic environments from oceans and seas to other major river systems and waterways. There are four saltwater aquariums, one of which is the 32 by 15 foot, 40,000 gallon Gulf of Mexico aquarium. This giant aquarium contains sharks, rays and moray eels. There are also many historical displays covering everything from Native Americans and Voyageurs to famous people associated with river transportation and exploration. We were impressed with the number of environmental displays in the National Rivers Center and of the abundance of environmental information. One interesting fact I discovered was how much water can be saved by using a car wash instead of a hose; a car wash can cut water usage in half! The Center is also a research facility, the National River Research Center, dedicated to learning more about the science and history of rivers. There is also a library of books, paintings, documents, photographs and manuscripts of America’s river history. One final feature of the new Rivers Center is the 3-D and 4-D theater. Museum goers get a break on tickets to the films, but you do not need to buy a museum ticket to see them. You can purchase tickets for the theater only. 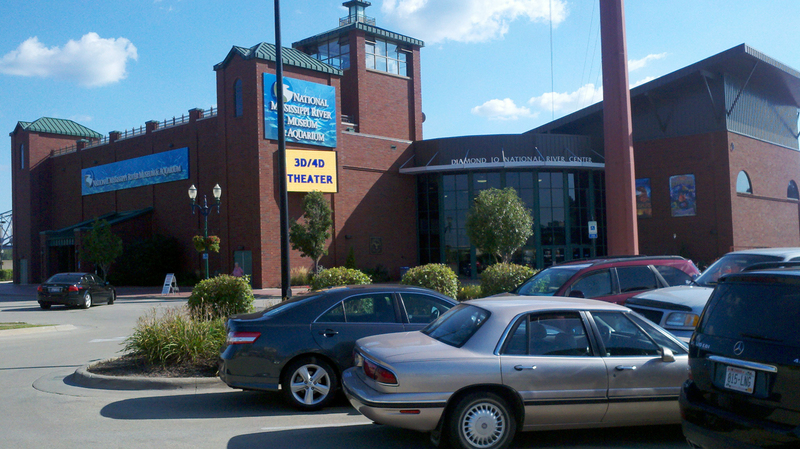 If you are in the Upper Midwest, a trip to the National Mississippi River Museum & Aquarium complex is a “must-see” opportunity for all ages. Make sure you set aside at least a half-day, and I believe, you will find things to see and do there even if you choose to spend an entire day. And, as an affiliate of the Smithsonian Museums, you can be sure that you will receive a high-quality learning experience. Saving the Environment – One Digital Business Practice at a Time! Although digital meeting and digital publication options for business have been around for some time, many businesses don’t take full advantage of them. At MTI we realized several years ago that the old ways of doing business weren’t sustainable. We also realized that if we were touting products that made buildings more sustainable and more environmentally friendly, we should probably be doing business the same way. Technology is not going away. While it certainly has negatives, the communication possibilities are so great, it needs to be embraced by businesses of all sizes. The digital communication practices that follow are sustainable business practices we firmly recommend. Minimize print matter. There is no reason to maintain a binder full of product catalogs in the 21st Century. PDF versions of product catalogs and product flyers are easy to search and easy to store, and they are much more environmentally friendly. We have all been to major tradeshows and conferences where we’ve witnessed volumes of discarded catalogs, brochures, etc. packed into overflowing trash receptacles. If we feel compelled to hand out some print matter, why not a business card with our URL? Or better yet, let’s just put our QR code on a sign and let interested parties take a digital image. The QR code reader on their smart phone can take them to our electronic media when they have time to look at it. Digital media can do so much more than print media. PDFs aren’t just about sending print and images. They can also contain video and audio. My document written in English can contain links to translations in other languages or explanatory movies with narrations in other languages. The possibilities are endless, and they can be delivered in seconds around the world at little cost and on demand. Utilizing email for product updates and company newsletters is also much quicker, much more economical and much more environmentally responsible than the postcards and brochures we used to rely on for getting the message out. Rethink business travel and training. Web meetings can and should supplant sales calls and business meetings. Most of us complain about the cost of gas, the hassle of airport security checks, the threat of bedbugs, etc., but are we still heading off to a meeting in some other state or some other country? Sure there are times when we have to be there in person, but many times we don’t; and the savings to the bottom-line and to the environment are huge! There are many ways we can do meetings online, and the costs have come down tremendously because of the number of services competing for your business. Not only can you hear and see each other, you can even work on the same documents online, and the down time involved with travel can now be used more productively. Web conferencing can also be used effectively for training. Most web conferencing software has a record function built in so that people who are unable to attend can get a rebroadcast of the session. This saves on the instructor’s time and expense, and it makes the content available in the same format so you’re confident everyone received the same message. Old habits die hard, but businesses large and small can benefit greatly from adopting 21st Century digital communication practices. They are sustainable, economical and effective.